One of the very few benefits of not being able to attend Ignite is to quickly check on any new features announced there, while sitting comfortably in front of your PC. Earlier today at Ignite, a new preview for the next server version of Windows was announced. I took the opportunity to download the ISO from MSDN and spin up a new VM for it while listening to the Keynote. Just as Joe Belfiore finished his demo-intensive presentation, my new toy was already up and running. The first thing you will notice during setup, is that the GUI install option is gone. You can choose between either “true” Core or Core “with local admin tools”. If you want the GUI, you need to enable it post install. If you install the GUI, without the Desktop Experience, you will get the new start menu sans the modern app bits. You do get the virtual desktops and Task View. There are some gotchas as well, for example the simple task of right-clicking the desktop in order to change the resolution will greet you with the lovely “You’ll need a new app to open this ms-setting”. Eugh, modern apps! And in case you missed the important announcements from the keynote, we also have Nano Server (plus Containers coming in the next preview), Windows Update for Business and the best one: advanced threat analytics! For the cloud people – Microsoft Azure Services that will further close the gap between the Public and Private cloud offerings based on MS technology. I’m sure more will come from Ignite, and other official and unofficial sources! 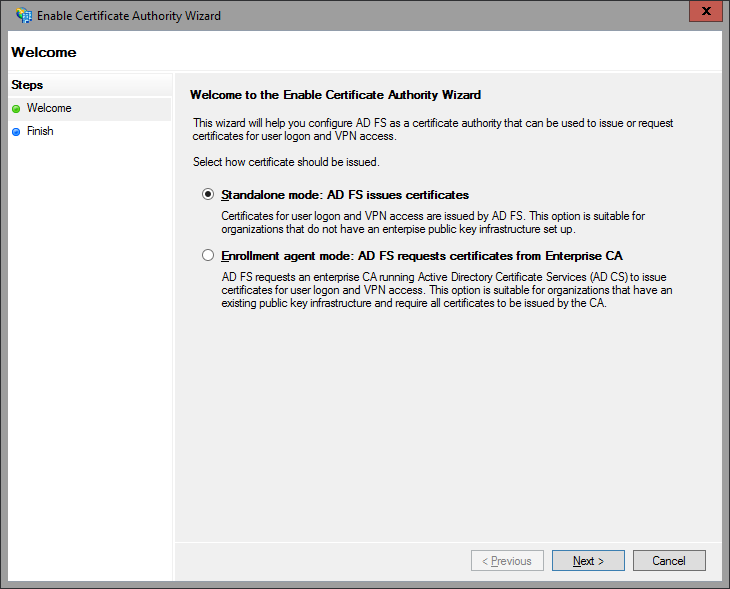 Anyway, what’s new in AD FS? The install process is pretty much the same. The GUI tools are also the same (you still use the MMC console that is). What about in the PowerShell module? A lot! For starters, the number of cmdlets available for the AD FS module for PowerShell is now… wait for it… 143! Let’s take a quick look in the order they appear in the MMC console. There are 5 nodes now, with the Service Node getting the most child items – all the ‘server-side’ configuration has been moved there. This is the central point for configuring new or existing Attribute Stores (remember that you are no longer limited to Windows AD!). 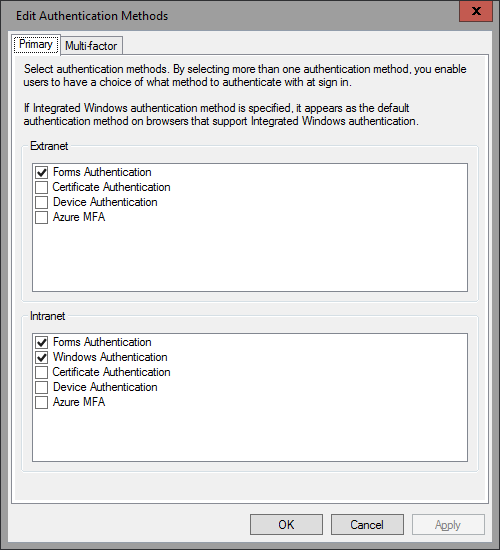 Azure MFA comes built-in now, and is available as both Primary and Multi-factor authentication method! You might have noticed that the per-RPT authentication policies section is now missing. It has been incorporated in the new Access Control Policies, which we will cover a bit later. You can also enforce additional authentication methods via the Set-AdfsRelyingPartyTrust cmdlet if needed. Sadly, no option to configure a specific MFA provider for RPT, it’s all or nothing still. Deactivating the feature takes a single click as well, and in case you are interested, the corresponding PowerShell cmdlets are Get/Set/Disable-AdfsCertificateAuthority. The Certificates node is pretty much the same, as is the Claims Descriptions one. There are a LOT of new claims however, with the total number increased to 77! PowerShell support yay! 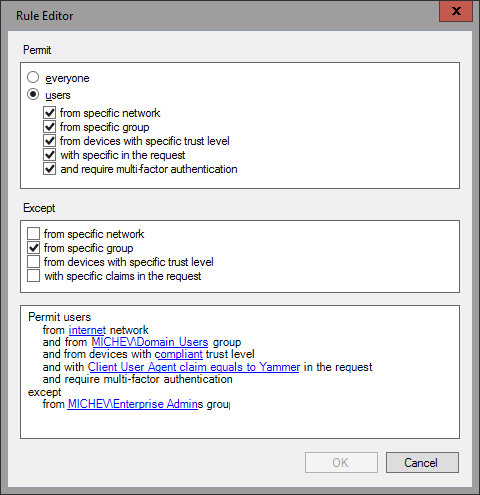 Device Registration configuration has also been simplified, but we have seen this one already in the previous TP version of Windows Server. The Endpoints configuration has not changed as well, but the number of endpoints has jumped to 59. They give you some hints of what is coming – OpenID, WAP proxy, WebFinger all built-in. Plus options to enable password change and CRL checks. The last node is the “Web application proxy” one and will be used to take a quick overview of the status of any WAPs you have in place. With this, we conclude the brief overview of “server-side” configuration node. The rest of the nodes allow you to configure ‘client-side’ stuff, such as RPTs and CPTs, OAuth clients and the Access Control Policies. Let’s start with the latter. Now, if you are using one of the default ACPs, it will actually allow you to pass parameters to it when assigning to specific RPT. So they can pretty much be used as templates (as they were called previously), and by adjusting the parameters for each RPT you can reuse them as needed. For newly created ACPs via the GUI however, providing a value for all parameters is required. Luckily, PowerShell doesn’t suffer from such limitations and you can use the New-AdfsAccessControlPolicy cmdlet to work around it, so you end up creating a template instead. Each of those default ACPs and any new ones you create can be assigned to one or more or the RPTs you have configured. This can be done via the GUI, where we have a new menu/right-click option, or via PowerShell and the Get-AdfsRelyingPartyTrust cmdlet. The relevant parameters are AccessControlPolicyName and AccessControlPolicyParameters, where the latter specifies the parameters passed to the general ACP template. The next node is the Relying Party Trusts one, which has changed a little. Instead of having two separate menu items for creating either a new claims aware RPT or non-claims aware one, the GUI wizard will now ask you that information on the first step. The rest is pretty much the same, with the MFA configuration replaced by the Access Control Policy and a new option to support OAuth in the GUI. Other than that, the process is pretty much the same. Once you have created the RPT, you can edit the claims rules and/or the ACPs in pretty much the same fashion as before (well obviously the ACP dialog is new). 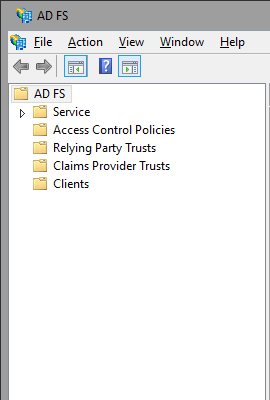 The RPT Properties dialog reveals a new tab for the OAuth Client Permissions, where you can add/edit OAuth clients and their associated scopes. The Proxy Endpoints tab is also new (or at least I don’t remember seeing it before). You can use one of the built-in clients, or create new a new one. 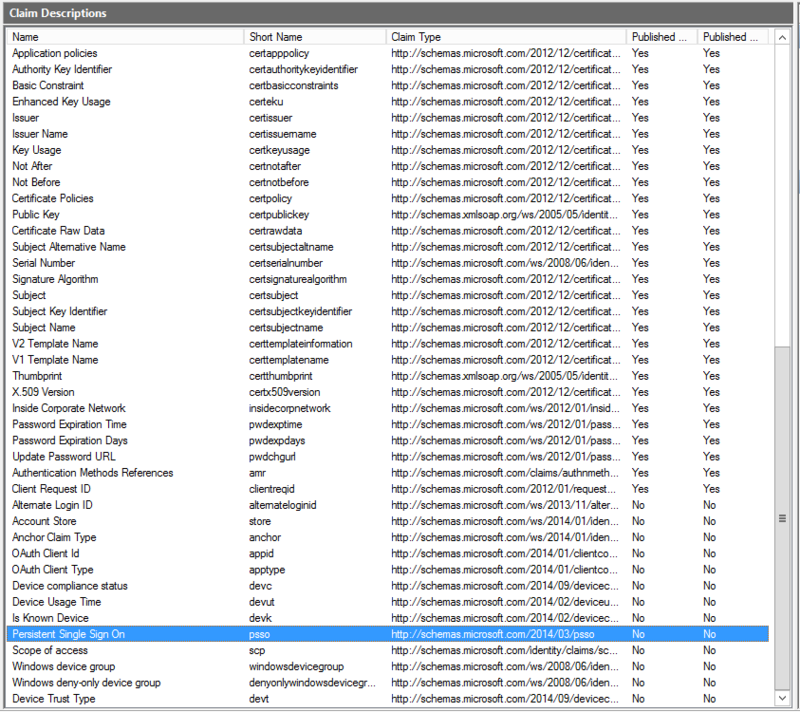 You cannot remove or edit any of the default clients, either via the GUI or PowerShell. Each of the OAuth clients can be assigned to any claims-aware RPT, along with one or multiple scopes, which allows you a granular control. And yes, those are controlled via PowerShell now if you have missed the news from the last preview, put a stop to the editing of config files! UPDATE: There is a great session from Ignite 2015 covering AD FS vNext, make sure to watch it. 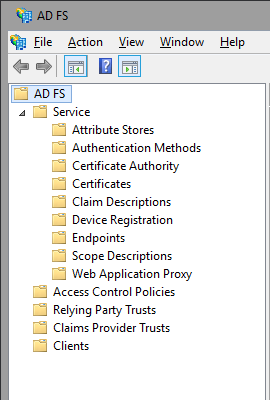 Here are some highlights: AD FS vNext servers will be able to join to existing 2012R2 farms, ACPs create from the MMC console can accept parameters if you leave the parameter (for example group ID) empty, the ability to use custom claims types with ACPs, improvements in permissions required to run/configure AD FS, lots of info about OAuth and OpenID Connect, per-RPT branding, using Device authentication as primary (how did I miss that, it’s clearly shown in the settings! ), support for time-limited group membership (connected with the JIT/JEA functionalities in AD vNext). So cool!